Atty. Vic Rodriguez in behalf of Bongbong Marcos reveals that they have doubted another intent from Comelec to sabotage or wipe out their evidence. The Comelec has requested the PET to allow them to have a temporary custody for the ballot boxes from Maguindanao, Basilan, and Lanao del Sur. The Marcos camp is not happy with this because these areas are included in Marcos’ electoral protest. On the Comelec’s letter of request dated April 22, it requests the Philippine Electoral Tribunal to grant them temporary custody of ballot boxes in various areas in Maguindanao, Lanao del Sur and Basilan. These are contested areas in Bongbong Marcos’ electoral protest. This is still pending until now. Marcos contests the said move of the Comelec. The explanation that this is related to the ongoing protest of the governor there is not just acceptable. They have taken Comelec’s action as a way to sabotage Marcos’ evidence for the electoral protest. Vic Rodriguez insinuates that they can erase numbers so that it won’t tally with the data on hand at the Marcos camp. Rodriguez said earlier that Leni Robredo again fooled the people by portraying herself as somebody who is struggling to pay the P8 M initial deposit of her counter-protest against Marcos. He said that a candidate who spent around half a billion pesos during the elections can’t have such problems. She is just acting out to get public sympathy, he assumes. Bongbong Marcos received a Letter from the COMELEC to request the PET to authorize them to have temporary custody of the ballot boxes and other election documents on 25 April 2017. This is not widely reported in the mainstream media. 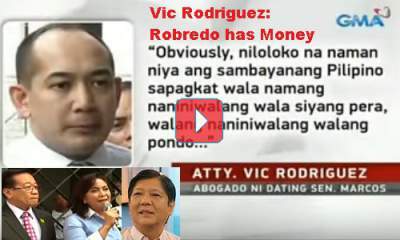 This can easily escape public scrutiny of not because of Facebook and Vic Rodriguez’ interview with CNN. Next post: Is Comelec still Supporting Robredo against Marcos? Naloko na pag pinagbigyan ang comelec magkakaroon na naman ng misteryo sa mga balota, talagang kadudaduda ang ginagawa ng comelec, ayaw talaga nilang malaman na nandaya sila, para siyang si abnoy na gagawin lahat ng paraan para hindi lumabas ang katotohanan. nakadismaya itong ginagawa ng comelec, can PD30 intercede and tell the comelec to leave BBM’s protest for the SC to decide? since BBM paid an enormous sum of money and let whatever protest in the comelec be done once BBM protest is acted upon? Its time for the President to intervene in as much that he himself was told by Bautista that his votes were manipulated. So please Mr. President we need a real vice president who has a heart for his countrymen and love for the country. Naku i dont think PET will allow the request of Comelec to have the custody of those ballot boxes.. hinde ganon kabobo mga justices… see! Dyan pa lang sa request ng Comelec may naaamoy na tayong hinde kanais nais… and dami daming delaying tactics ng mga mandaraya.. dapat lang kabahan itong estupidang pekeng vp.. lapit na kayo singilin ng KARMA! PET, as the one and only court for the protest should NOT allow Comelec to get away with the very obvious intention of distorting evidences. It is the interest of the electorate to know the truth and the LEGITIMATE VP must be declared.